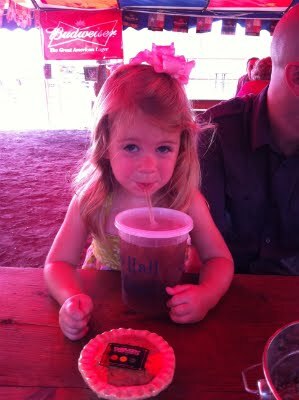 My new friend told me she drinks 5 cups of tea a day, and that's after cutting back from one every hour of the workday. Needless to say, I realized that I could be benefiting so much more from tea! So I added a cup in the late morning and it has changed my life. Waking up at 6 AM to have my quiet time before the kids get up has been a very positive change for me. I wish I had done it sooner. But I've become rather dependent on naps, which is not realistic every day. Anyway, my mid-morning tea is helping so much. Sometimes I even skip the afternoon one. Now that you're crying tears of boredom, here's an assortment of pictures from my iPhone. 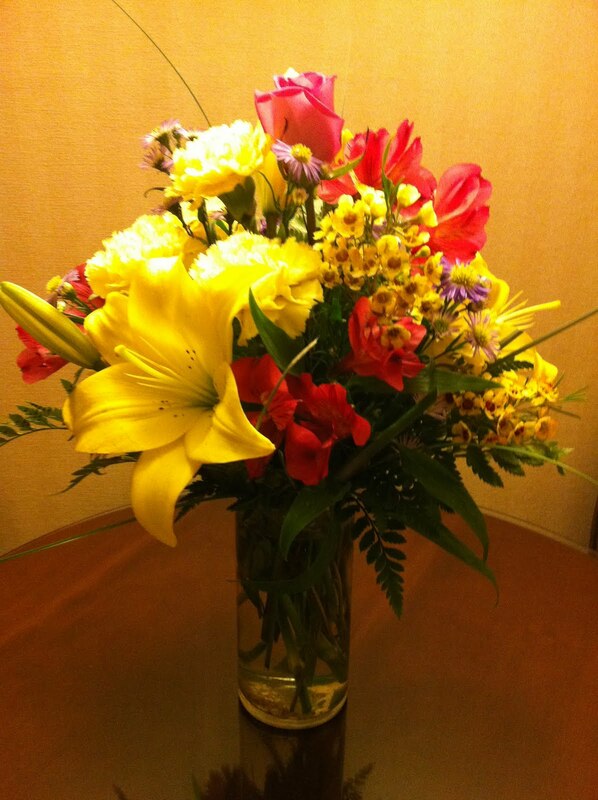 I know you're just so thankful you stopped by today. This is evidence of the hottest day in the history of Houston, Texas, which happened in August (the 20th, I think). It was BEYOND. I got to host some friends from out of town that day and, bless their hearts, it was just so horrid. 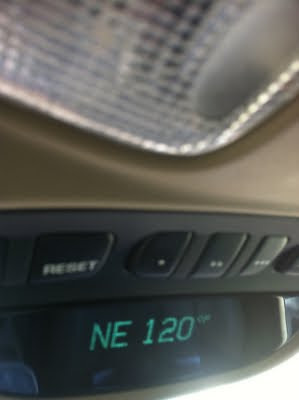 It wasn't actually 120 degrees but for the temperature gauge to even draw close to this is insane in the membrane. 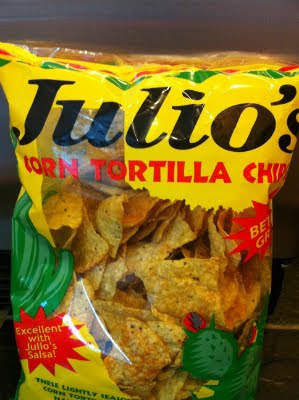 These are the chips that I became addicted to this summer. However, I came down with a stomach virus after putting them in a taco salad and it cured my addiction. 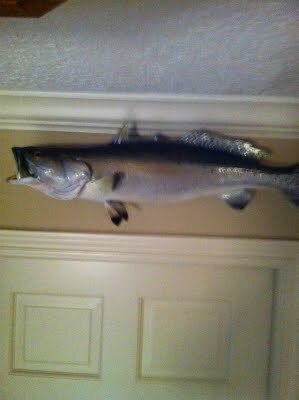 My dad called me a few months ago to tell me about this huge trout he caught. I said, "Oh, good, Daddy! Are you going to cook it for us?" He might have used a minor expletive to express his state of flabbergastedness at my suggestion. It may have sounded something like "Heck no! That was a career trout!" Here it is, folks - Dad's career trout. 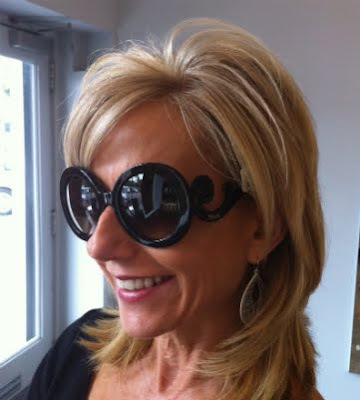 Here's my mom trying on some Willy Wonka sunglasses. There was a clothes basket sitting by the laundry room door, just waiting for mama to tackle it. Inside was Annabeth's special blanket - AKA Giraffe Babies - which had suffered a baptism of the most unfortunate kind in the night. 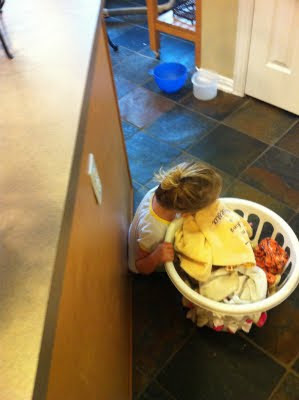 The house had gotten very quiet and I didn't know where Annabeth was. This is how I found her. It was the most adorably tragic sight I'd ever seen. 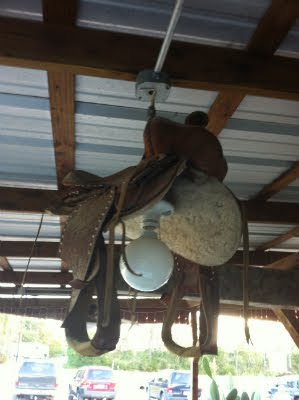 This is a light fixture at a local hamburger joint. 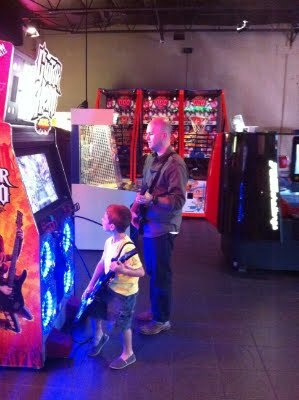 My guys playing Guitar Hero. 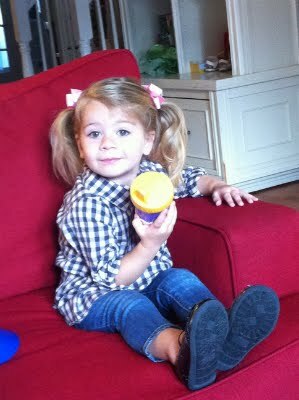 This is the day Annabeth let me put pigtails in her hair. She will not let me do a ponytail (so ironic) but I achieved this by telling her she would get to wear two bows. 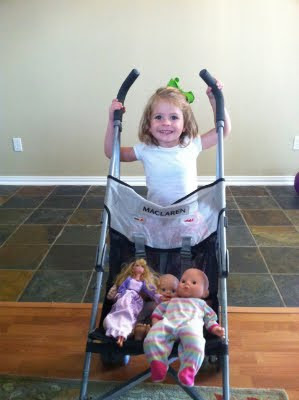 This is the day she wanted to stroll her baby dolls down to the school to get Jackson. It appears that she's had a haircut but she really hasn't. Curtis, AB and I went to the Zapp Hall antique show this week. We had lunch at Royer's at Zapp Hall and it was incredibly yummy. 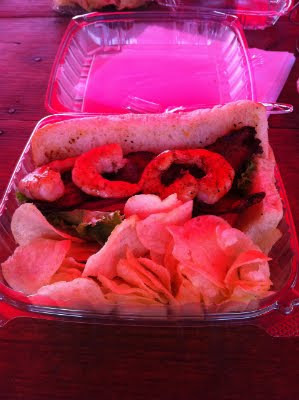 This is the shrimp BLT. It has become legendary in my memory, much like Goode Company's BBQ chicken sandwich at the rodeo. 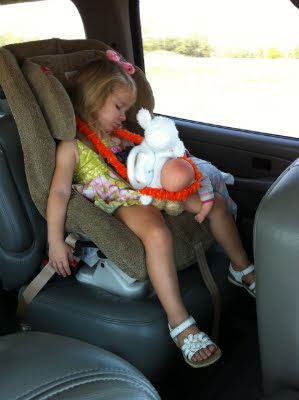 Thanks to the orange lei, Annabeth fell asleep flanked by her lamb purse and baby doll. Many months ago my friend Paige, who is the director of women's events at LifeWay, told me about this new conference for moms that they were putting on in Birmingham. She asked if I'd like to do a breakout and I feel sure I responded with my oft-given answer, "But I don't speak." She was kind enough to offer to put me on a panel, which was a little more up my alley. The conference, Dot Mom, finally happened last weekend. Y'all, it was a blast. They are doing it again next year and I really, really hope to attend. I can't say that my participation in the panel amounted to much more than head nodding or head shaking, but what I received from attending the worship times, main sessions and breakouts was tremendous. We heard from Angela Thomas, Angie Smith, Vicki Courtney, and Priscilla Shirer in the main sessions. 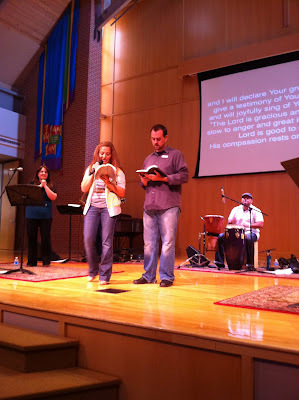 Melissa Greene, who was in Avalon, led worship. On Friday night she did a mini Avalon conference for us and I decided I need her to sing "Adonai" to me every night before I go to sleep. That wouldn't be weird, would it? Sophie and Melanie, AKA Boo Mama and Big Mama, were the emcees of the event. They were darling and so fun! I felt like a proud little sister watching them on stage. I heard amazing things about all the breakout sessions and I wish I could have gone to every single one. I got to sit next to Angela Cottrell in our panel discussion for moms of kids under 13 and listen to the incredible wisdom with which she answered the ladies' questions. I could almost see when she would hear the Holy Spirit give her something to say. It was awesome. I walked away from this conference feeling free and encouraged as a mother rather than feeling like I wasn't good enough. Honestly, the last thing I needed was to bring home a long to-do list that I cannot live up to. Instead, it was like I took off a heavy backpack and came home with a bounce in my step. A huge added bonus was that my dear friend Heather came from Nashville and I got to see her for the first time since her family moved away in July. I'm so thankful she came! We got to have dessert at Cheesecake Factory on Friday night with Robyn (hostess with the mostest) and Fran. I will not soon forget when Heather sweetly coerced the valet guy to take a series of pictures of us. Nor will I forget that Heather ordered two pieces of cheesecake to sample and later confessed that she didn't like cheesecake. Bless her, Lord. Then we had a minor/major scare when a man in camo sat at the table next to us and we saw that he had a gun in his jacket. We left speedily. I feel certain that we burned as many calories laughing (as well as running away) as we ate in dessert. Here are a few pictures that I either took with my phone or stole from a friend. At the end is a recap by David Lowe. Who knew the Duggars would make a surprise appearance? My mom sent these flowers to my hotel room and I almost cried! I felt so close to her the whole weekend. I love you, Mama. Fran, Robyn, me and Heather. Thank you Mr. Valet Man. LifeWay Women, .MOM Event Birmingham AL 2011 from David Lowe on Vimeo. When it rains, it pours, y'all. (Unless you're in the worst drought that your city has seen since the 1700's.) What I'm trying to say is that I've gone out of town two weekends in a row without my chil'run (as Annabeth says with a growl). That was so crazy, but I'm not leaving again until November. Curtis and I flew to Chicago on Thursday, September 15, for a board meeting with As Our Own. We had all afternoon to walk around Michigan Avenue and do the things that tourists with just a few hours do. We missed out on the architecture tour but we'll be back next year and we'll prioritize it then. 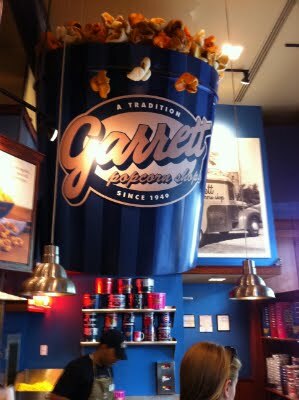 I was told to get the Chicago Mix at Garrett's - cheddar and caramel. Whoa Nelly, I did not see myself liking that, but it was delish. We woke up bright and early on Friday. I ordered breakfast for myself, which may be my favorite thing about traveling. It's such a treat for a mama whose mornings fly by at 90 mph. 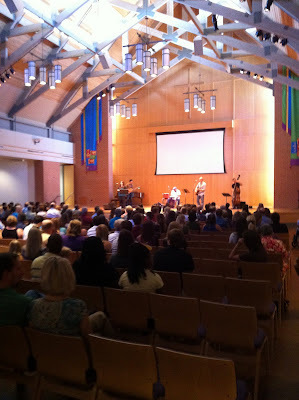 Our board meeting was from 9-4 at Moody Church, which is a faithful supporter of As Our Own. The sanctuary is absolutely gorgeous. 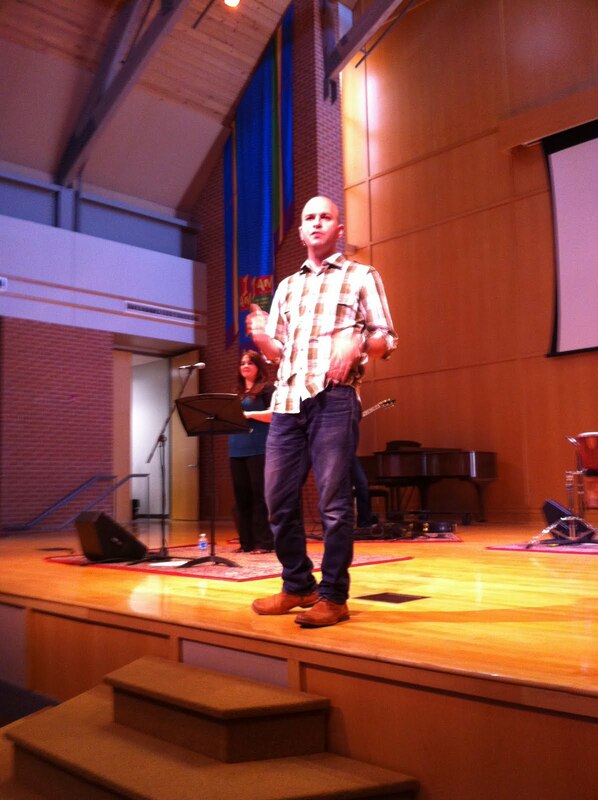 We were really inspired hearing our friend Ralph talk about his vision for the ministry. It was also our first time to meet the other board members in person. They were wonderful! 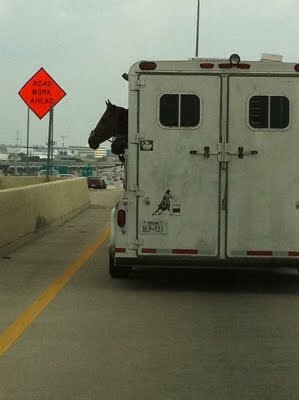 Welcome back to Texas! This was on a very fast and busy freeway interchange in the middle of the city. 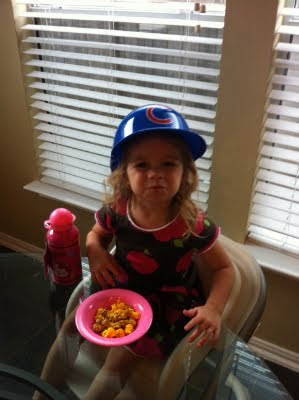 Here's the Sis enjoying the spoils of Chicago. And the Sir, showing you his popcorn. 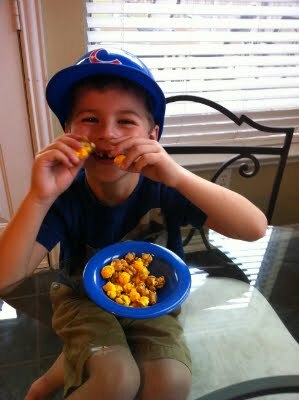 When they were all done, Jackson had eaten only the cheddar popcorn out of his bowl and Annabeth had eaten only the caramel out of hers. 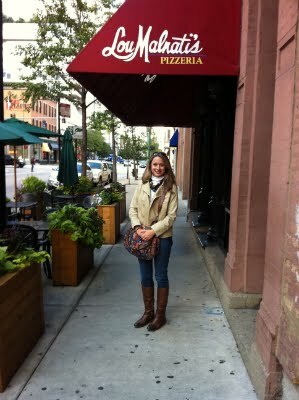 I had been to Chicago a couple of times when Melissa was a student at Moody Bible Institute. This was Curt's first trip to the Windy City. He fell in love with it and said he wished that we had gone to grad school at Moody after he finished at Houston Baptist. That would have changed so much about our journey, but I couldn't help feeling the same way momentarily. It's such a great city. I'm glad we have a reason to go back on a regular basis. Ten years ago, before transferring to Moody and moving to Chicago ever even entered my mind, I was a little sophomore at Baylor University. One fine central Texas day I went down with a friend to a place cleverly called Waco Hall to listen to an increasingly well-known “upcoming” musician. All I knew about the musician I had gleaned from the signs scattered on walls around campus: he had really good hair. The musician was Shaun Groves. And if I remember correctly, he had just released his first big record Invitation to Eavesdrop. I knew, even then, after just a few minutes listening to Shaun sing, that he had a special voice. Something about him was unique. I sensed that he was a person who both thought and felt deeply about faith and the world. What I most certainly did not sense is that in less than a decade I would be bouncing around East India with a tiny group he was leading. But in the third world together we were destined to be. April 2009 to be exact. Interesting verses, right? We both suspected that these verses are crucial to the Church’s conversation concerning wealth and poverty. Shaun swears that, among other things, our conversation about these verses has something to do with the song “Enough” on his new record Third World Symphony. I imagine he is grossly exaggerating but I really don’t care since it happens to be my favorite song on the album. These were fun times, good conversations. But nothing could have prepared me for the moment, just a few hours later, when the ideas in this conversation would become a human being. Kiran is the real reason Shaun wrote "Enough." Nothing could have prepared me for Kiran, a Compassion student who lives in one of the slums of Kolkata. On April 30, 2009 seven members of our team crammed tightly into the home of twelve year old Kiran Mallik. The home she shares with her four other family members. Three of our team members simply couldn’t fit inside. The tiny little shack was about the size of a twin bed, approximately the size of my spare powder bath. Here is a picture of Kiran standing outside her house. We couldn’t stand up inside the little house so with knees and thighs touching, we kneeled around on the floor. 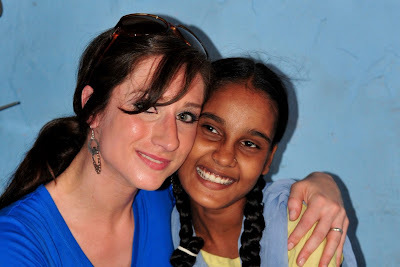 We sat captivated by Kiran as she revealed to us who she was through a translator. She told us how much she loves Jesus, how she loves to study and hopes to become a teacher someday. She beamed in agreement and with satisfaction. But the thing is, I really couldn’t see beauty. What I saw on that hot April day was a flimsy little box of a house roofed with plastic paper, rocks, and sticks. Later as we walked around the slum, Kiran would start to cry. Tears of joy, she said. Tears because she was just so happy she had God. Then she would literally burst forth into songs of praise. This is the stuff of the Psalms or maybe even the book of Acts. I saw these things in an Indian slum. And all I could think about was stuff Kiran didn’t possess. The dark, scary place we were walking around. All Kiran could think about was that God was with her. Where I saw tremendous lack, Kiran saw an extravagance worth displaying. The radiant joy Kiran effused challenged the “lack” I saw. Her intoxicating presence told me she lacked no good thing. This was one of those remarkable moments when fixed values start to move. A paradigm shift, if you will. I had to start deconstructing and reconstructing meaning; I had to start trying to make sense of things again. Clearly I had been missing something major about basic life questions. I started posing new questions: What does it really mean to be blessed? What does it mean to have enough? Can I really trust myself to answer this former question? Being in Kiran’s presence was something of a dream. Surreal. I felt like I was bound in chains in a dark room gazing out a window at a little girl skipping in a field of sunflowers at the brightest point of the day. It wasn’t that Kiran was proud of what little she had. That would have been admirable, indeed. But that wasn’t it. It was the very idea that Kiran had absolutely no idea she had little. No one could have convinced Kiran she was “suffering,” not without performing some kind of lobotomy anyway. She was rich and full, living off of a couple of Compassion meals. She knocked me off my white horse. I wasn’t the one doing the liberating anymore. I never was. Maybe I had been bound all along. The remarkable thing about the Proverbs text I mentioned before (30.7-9) is not that it mentions living in the middle of two extremes: poverty and wealth. The astonishing thing is that it links spiritual infidelity to these two extremes. In other words, living off of just enough, that which is necessary, is spiritually advantageous. At least according to the wisdom writer. Kiran’s effortless joy, her tremendous wealth in living off the Lord alone, not only reverberates the sounds of the ancient sage; it takes the shape of a cross. Her abundant life is nothing short of cruciform. Undeniable power in perceived human weakness. And not even the thickest darkness can obstruct this kind of light. It is the overwhelming penetrating light of the cross. I was blinded by it because I couldn’t stop staring at Kiran. My vision will never be the same. If I close my eyes and focus long enough, I can still hear the sound of Kiran’s voice. She is singing, “Lord, I lift Your Name on High. Lord, I love to sing Your Praises.” The cadences of her voice are still in my heart. “Oh God, what do we see and hear? Let it come to us. In my mind the width and depth of this post should reflect how profound and exciting the first two public Sundays of Bayou City Fellowship were. I'm giving up on trying to match that in words because there's no way I can measure up to it. 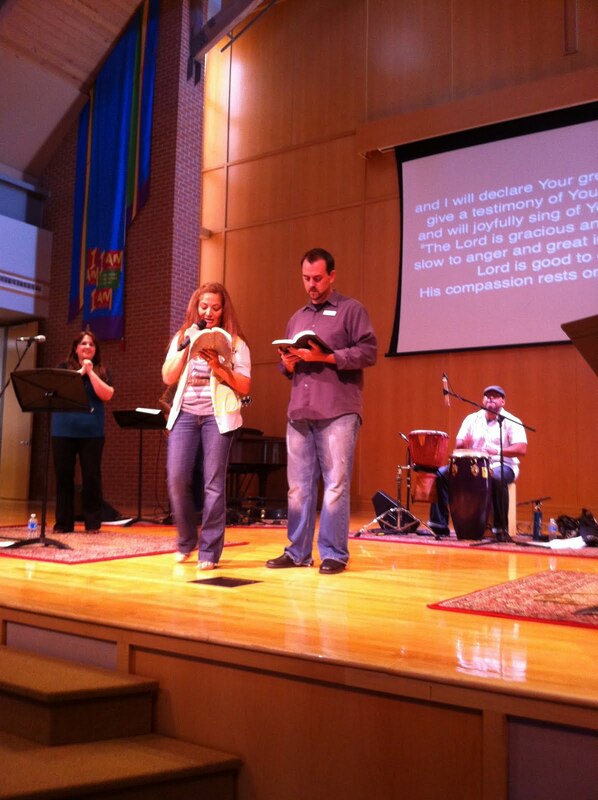 God displayed His incredible kindness and power to us as we launched our church. My mom described that first Sunday really well on her blog right here. We had plenty of nerves on the day of our dry run, which just consisted of our core team and extended families. But I think that across the board we were all really joyful and at ease on our launch day. It's weird to say that it was fun, but it really was. When people started arriving - and kept arriving and kept arriving - it was surreal. We had absolutely no idea how many folks to expect, but we certainly did not anticipate the crowd that we had. So many dear friends came, even from out of town, to cheer us on. That meant so much. There's a statistic that says the average church plant has 50% fewer attendees on the second Sunday than on the first. Since I knew we had a lot of folks that first week who were only coming to encourage us, I tried to prepare my heart and mind for a much smaller crowd the second week. I was truly fine with that but I did not want it to discourage our team. On the second Sunday I arrived a little frazzled, having not prepared very well for that morning. All our clothes needed to be ironed, which is never good. I'd intended to get us donuts on the way to church but the Lord whispered to my heart, "Give them cereal right now!" Ha! Our core team met to pray and after that the stress of the morning turned into peace. I hung out around the kids' check-in tables and got to meet some of our new families, which I loved. Eventually I walked over to the chapel and I couldn't believe my eyes. People came back. It was not quite as full as the first week, but definitely in the same ballpark. This was not about numbers, but we were encouraged to have people to serve! (I may break out in "Be Our Guest" from Beauty and the Beast.) Along the way there have been more than a few "Are we crazy?" moments. When I saw our group, I knew that we were not crazy. We heard God in this. And then I freaked out a little because my husband is a pastor and I am a pastor's wife and do we have any idea what we're doing and we must be crazy! Ha! Two really special moments that I will always remember are my Aunt Gay sitting with me on the front row on our launch day and later, Curt's family members calling one by one from Missouri to see how everything went. I got emotional when his grandpa called because I know he will probably never make it down here for a service, but he's so proud of his grandson. When Grandma Wanda, who is with Jesus now, saw Curtis for the first time as a newborn, she said, "There's our little preacher." Grandma was with us in our hearts on that day. I want to thank all of you for your prayers as BCF launched. We had so many phone calls, messages, gifts, and texts from friends and family that it was almost exactly like we'd had a baby. Curtis and I may or may not have some baby weight we need to lose. Both sets of our parents have been beyond amazing. We would not have survived the ups and downs of this process without their support and encouragement in our calling. My sister and Colin have been a huge blessing to have with us. I would never have imagined that God would move them back home in time to be a part of everything. And can I just say that our whole core team has blown us away? When I think of them, I think of the word grace. We do not deserve to get to serve with such humble, supportive, powerful, loving, enduring, believing men and women. Last week Curt was having terrible nightmares and when some of our team found out, seven families prayed over us every hour through the night. Can you imagine? We didn't know until late the next morning - after a good night's sleep! I cannot wait to get to know the people God is calling to be a part of BCF. I have loved looking across the chapel at all the unfamiliar faces and knowing that a year from now, God-willing, these will be individuals whose stories and hearts I know. Our little team that has spent the last 6 months building this church has experienced Jesus Christ together in a powerful way. Please continue to pray for us as we seek to introduce the lost to this same mighty, faithful Savior, welcome prodigals home, and serve His bride. These are some pictures I took on our dry run and launch days. This is the chapel within the school complex. Everything else takes place inside this building. Setting up the check-in station for the dress rehearsal. Like everything else, this area has already evolved. Those amazing peeps are Robbie, Ashley and Dana. 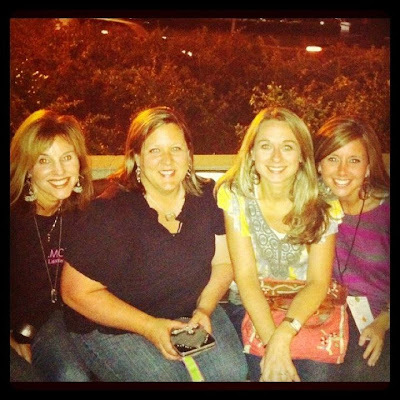 Annalee, me, Erin, Lisa, and Cassi. These are some faces you'll see in the kids ministry. Cassi runs the show and she is awesome. Our first experience with tear down. Look closely and you'll see our first 4 guests sitting down. Ernest and Debra opening up the service with the Word. I can't decide if I feel more like our baby is being born tomorrow or if our baby just took her first steps. Curtis looked at me last February and said, "I'm nine months pregnant with a church." So technically that means our baby is just now sitting up. At any rate, our core team has spent the summer praying, seeking God's will, planning, and preparing to serve our city. 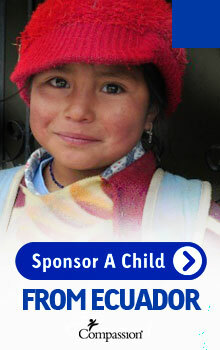 The day we have been looking forward to since our vision dinner on March 26, 2011, is upon us! Bayou City Fellowship launches tomorrow morning! At 10 AM! At Houston Christian High School! In the chapel! We are ready for you, peeps! I can hardly believe this day is here. There is so much I could say about the process but it all boils down to this: God is faithful. And my husband is a pastor. Who woulda thought? Well, his grandma called it on the day he was born. But that's another story. If you are in the Houston area and you don't have a church family, we would love for you to visit. If you're not a Christian but you're seeking answers to spiritual questions, we'd love to have you. If you're someone I went to school with back in the day and you're thinking about coming, please know I would be over-the-moon excited to see your face tomorrow. Or at any time, for that matter. Everyone is welcome, whether you have half the Bible memorized (wow) or whether you're not sure you even own one (we have one to give you). We will be ready to receive kiddos at 9:30. Since it's the first Sunday, it might be a good idea to come early to get your littles checked in. Cassi and Captain D and their whole team (which includes me every other week!) are excited to meet them. Houston Christian High School is located on Beltway 8 at Kempwood, between I-10 and 290. The parking lot entrance is on Kempwood rather on than the feeder road. When you park, there will be signs and friendly faces to show you where to go. 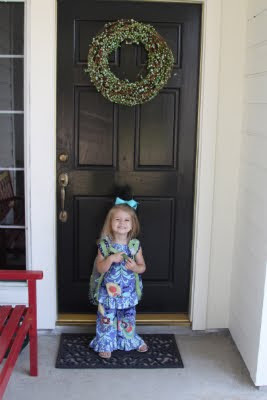 Annabeth was really bummed when Jackson started school and she didn't. 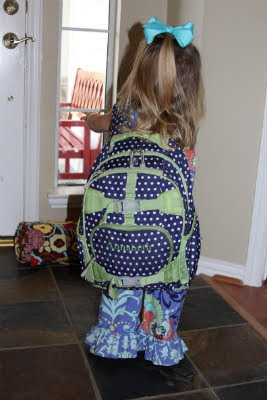 That morning as we walked out the door, she said, "Where's my pack-pack!?!?" and I sensed the potential for a meltdown. We had to break the news that her school didn't start for another week. I completely expected Annabeth to be devastated that her brother was gone all day, but she does not seem to mind. She likes having the whole house and all the toys to herself. I thought she might be bored and therefore more of a handful, but that has not been the case. It took two days to learn that the first hour after Jackson gets home from school is volatile. 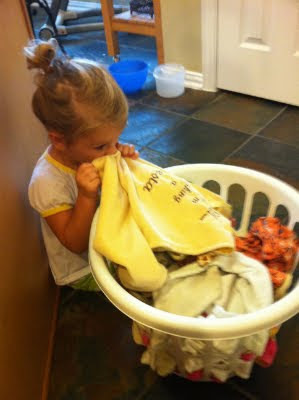 The power struggle between my kids is something to behold. Brother wants to tell sister what to do and what she can and cannot play with. Homegirl is no longer having it. For now, I'm trying to avoid the power struggle by having Jackson go straight into the game room to watch a movie and rest. If Annabeth can be calm and sweet, she can join him. I've enjoyed getting out and doing things with Annabeth that I would not normally do with two kids in tow. The grocery store isn't too bad if I can bribe her with a Dum Dum to sit in the cart. For some reason she really resists the carts. On Wednesday we got to spend some girl time with my sister. We picked up lunch from Zoe's Kitchen and took it back to her adorable house. (I had the chicken roll ups - so yummy!) We had a sweet time together. I still get giddy about having spontaneous sister dates. 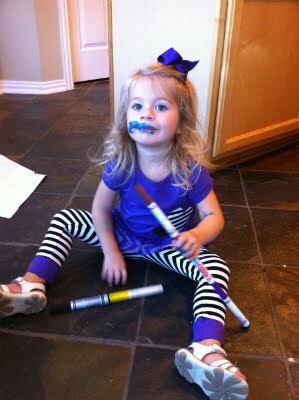 A couple of days ago, I thought I heard Annabeth yelling "Poo poo!" during her rest time, which sent me running up the stairs at the speed of light. I opened the door to find her staring at her leg and crying "Boo boo! My boo boo hurts. Kiss it, Mommy." Upon inspection, I found that this boo boo was actually pizza sauce. Annabeth went back to mother's day out on Tuesday morning. It was nice not to be nervous or emotional about it at all. Although I did get a little lump in my throat when I picked her up and we walked past Jackson's old classroom. It was weird not having him there. This is our fourth year at this preschool and I feel like an old pro now. I remember my first day to take Jackson at age 2.5. I was a couple of months pregnant and just getting past the morning sickness. I had on some frumpy workout clothes-slash-pajamas and no makeup, but all the other moms were dressed up and perfectly put together. I was mortified. I never really saw that happen again, but I realized the irony on Tuesday when I put on a sun dress to take Annabeth. But it was only because it's been melt-your-face-off hot (truly, it was like 110 degrees) and nothing else would do. And I was meeting friends for lunch at a tea room. Annabeth's teachers are incredibly warm and kind. Yesterday one of them got down on her knees and welcomed AB with a hug. There are lots of little girls in her class, as opposed to last year when she was 1 of 3. It is a very ethnically diverse group and I'm glad about that. Here's the sis before school. She looked so cute. She reminded me of a turtle with her big ole back pack. After school we had our third annual Back to School play date with Missy and her kiddos. 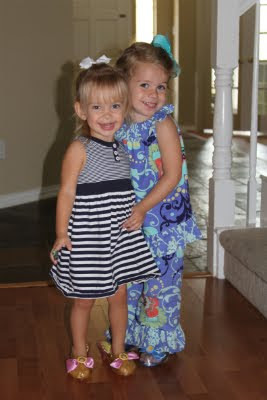 Ellison and Annabeth put on princess shoes and started jumping up and down. 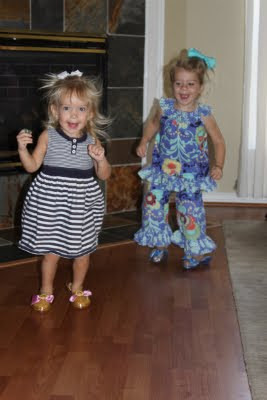 We think they might have a future in tap dancing.